May is National Moving Month! 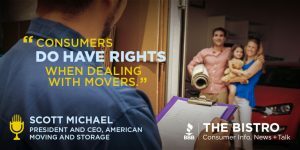 Scott Michael, President and CEO of American Moving and Storage Association joins us on The Bistro to educate us on our rights as consumers when hiring a moving company. He also provides moving tips and great advice to help the process go smooth and easy!